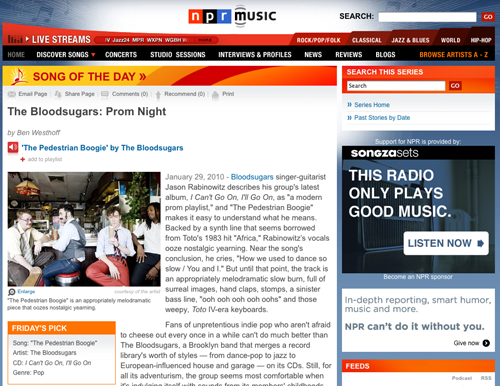 News :: The Bloodsugars are NPR’s Song Of The Day! NPR featured “Pedestrian Boogie” today, track two off of “I Can’t Go On, I’ll Go On.” And they had some really nice things to say too – “Fans of unpretentious indie pop who aren’t afraid to cheese out every once in a while can’t do much better than The Bloodsugars, a Brooklyn band that merges a record library’s worth of styles — from dance-pop to jazz to European-influenced house and garage…” Read the full article here. 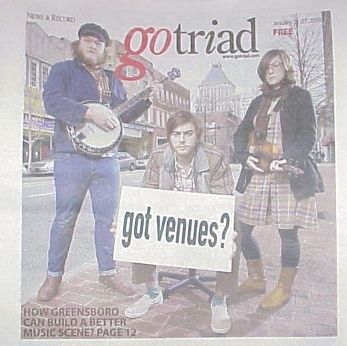 Israel Darling was interviewed by Greensboro’s Go Triad for a piece on the local music scene, or the lack there of, as due to too few live music venues in town the local bands are having a tough time of it. Read the full article here and check it, Israel Darling made the front page!